The combination of HAKITEC 750 weather protection and HAKI Universal Scaffolding means that structures can be fully enclosed – keeping the weather out, and the heat in. 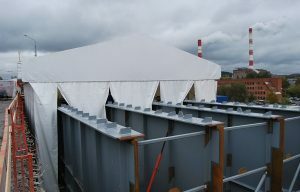 HAKI Containment Systems allow work to be carried out all year round, no matter what the conditions. This also means that temperature- controlled workplaces can also be created, in situations where a specific temperature needs to be maintained at all times. Projects can continue to schedule in safe, comfortable environments, without the risk of damage to whatever is housed inside.